We’re coming to the end of the first half of the book of Acts, so this morning will be the last in the current series (until next year). But today we’ve got one more chance to see Peter and the church in Jerusalem, as they encounter once again the God of the impossible. 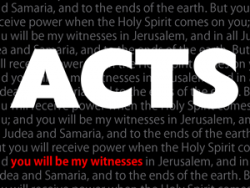 For the last two weeks in our series looking at the book of Acts, we’ve been talking about the events surrounding the death of Stephen. But what about his death (and life) itself? John Dalrymple considers Stephen’s “falling asleep” from a very personal perspective. The Bible is clear that God does not cause bad things to happen. But again and again, we see him using bad news to do good things. That’s exactly what happens after the murder of Stephen, as we see in the next part of our journey through the book of Acts.